This Sermon concluded the 2012 VBS, the theme of which, “Nothing is impossible with God” It was a wonderful week of great music, stories, games, snacks and fun as we were all reminded that with God the Sky is not even the limit. 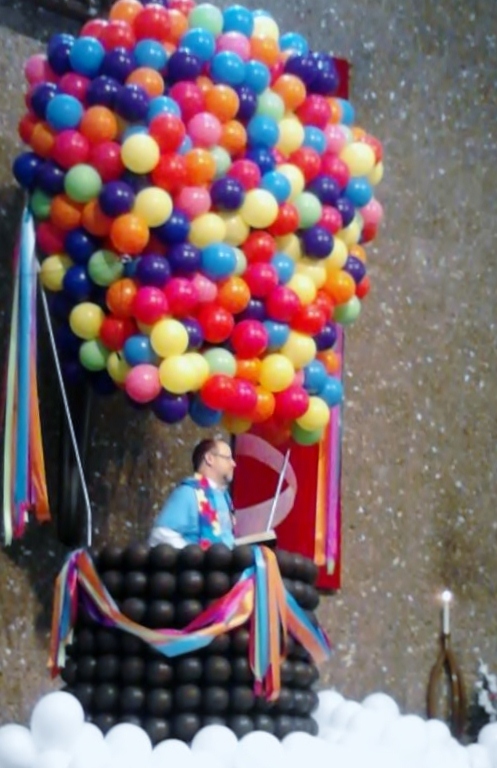 Plus it gave me the opportunity to preach from a Hot Air Balloon in our sanctuary. This entry was posted in Faith Shots, Sermons and tagged Childrens ministry, faith, god, Preaching, Sermon, sky vbs, United Methodist Church, VBS. Bookmark the permalink. how was the balloon made? would love to do this for our VBS! We worked with a design company that used a metal frame the supported the basket and balloons. They used some kind of foamcore or cardboard display type panels for the basket and balloons. People from the church blew up and tied the balloons and they applied them to the panels. I can get you the contact info and they can tell you exactly what materials they used etc.